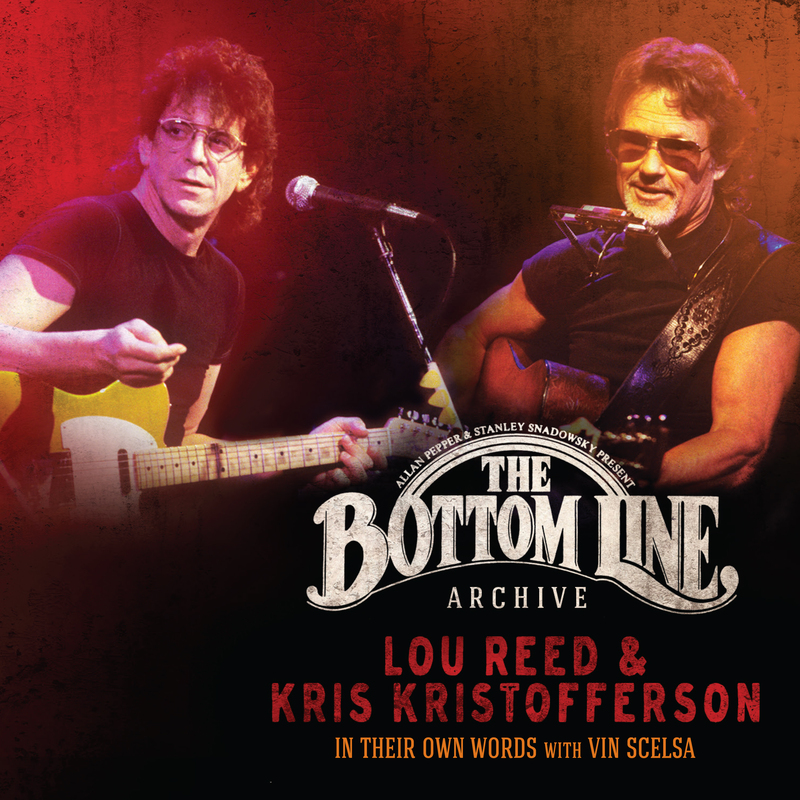 New York, NY – August 1, 2017 – The Bottom Line Archive Series presents its next release: the once-in-a-lifetime live performance by Lou Reed and Kris Kristofferson at the height of their craft, set for release September 15. Recorded at the legendary Bottom Line club in Greenwich Village, the album presents an evening of music, songwriting and storytelling – intimate, acoustic, historic. The Bottom Line Archive label is distributed via BFD/Red; BFD is a division of Bob Frank Entertainment. Lou Reed and Kris Kristofferson: In Their Own Words with Vin Scelsa is the only time these two master songwriters performed together. Over the course of one night (2/2/94) with noted radio personality Vin Scelsa leading the conversation, Reed and Kristofferson swap stories and songs. The evening and two-disc set includes Reed performing eight songs including Sweet Jane, Romeo Had Juliet, Legendary Hearts; Kristofferson’s seven include Me and Bobby McGee, Sunday Morning Coming Down, Help Me Make it Through the Night; and each performing a cover (Kristofferson does Bird On A Wire, Reed performs Tracks of My Tears). This release is the 12th in a planned rollout of titles over the next few years, including classic live performances by Jack Bruce, Ralph Stanley, the Brecker Brothers, Pete Seeger & Roger McGuinn, Harry Chapin and Kenny Rankin, among others. Bottom Line co-founder/curator Allan Pepper has recordings of more than 1,000 shows from Greenwich Village nightclub, which always booked an eclectic mix of rock, jazz, blues, folk and other forms of music during its 30-year run. Pepper and the label are currently in conversation with representatives from many of the acts. All music from The Bottom Line Archive was mixed and mastered at The Magic Shop, an award-winning state-of-the-art studio in New York. The Bottom Line Archive can be pre-ordered on Amazon and iTunes; and available on all digital providers. Previous editions of the BLA series are also available on Amazon and iTunes.